Ocean lovers, artists, musicians, locals, and more joined us on May 19 at the Volcom Garden in Austin, Texas for art, music and beverages as Volcom and PangeaSeed teamed up for an ARTivism exhibition to help raise awareness for our beloved oceans. There were over 100 artworks on display and live music by Magnet School and Black Mercy. This event also celebrated the exclusive Volcom X PangeaSeed product by featured artivists Aaron Glasson and Jason Botkin where a portion of the proceeds will be donated to PangeaSeed to help raise awareness of environmental issues affecting our oceans. 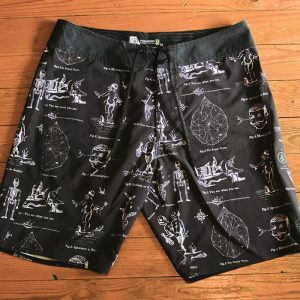 Aaron lends his activist-driven illustrations to these boardshorts with depictions of humans, fish, boats, and their relationships to each other. One-liners caption the art with “You are what you eat,” “Mercurialism,” “Ignorance is bliss,” “The empty ocean,” among others. Stand tall and proud with these good-hearted boardshorts as a portion of the proceeds benefit PangeaSeed and their aim to raise awareness of environmental issues affecting our oceans. 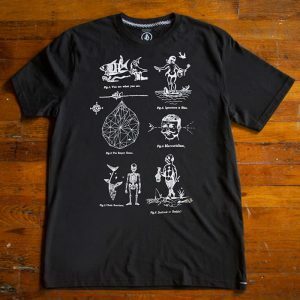 Artwork addressing man’s relationship to the environment is seen on the front of this Aaron Glasson artist series tee. It signifies effects we’ve had from our oceans due to poor ocean health, combats human ignorance to sea life, and hopes to strengthen the prosperity and longevity of our oceans through the power of community. Jason’s message is simple: It’s not too late to take action against the copious amounts of plastic being produced in today’s modern world, and selfishly being dumped into our oceans. 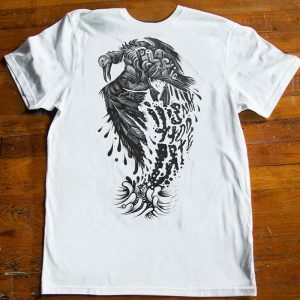 Be a strong supporter, along with PangeaSeed, to help protect our oceans and wear this tee proudly. For the first time, PangeaSeed Foundation opened their artwork archives and featured a selection of over 100 art prints, created by some of today’s most renowned contemporary artists, for their groundbreaking Sea of Change print suite program. Each artwork in the Sea of Change series focuses on a specific threatened ocean species, vulnerable habitat or environmental issue. It is an artwork collection like nothing else. They believe that a drop of paint can create an ocean of change, and by harnessing our collective creativity, we can help save our seas! Through March and April, Volcom and PangeaSeed teamed up and asked you to harness your creativity and give our oceans a voice via art and activism for a chance to have your work featured during our May 19 event at the Volcom Garden. And the response was remarkable. It was a tough decision process, but we nailed down 10 lucky winners from around the world and had their artwork on display at this event. Congratulations to the winners – thank you to everyone who submitted – and scroll below to check out the winning pieces! The Volcom Garden is a full-time art gallery, music venue, and boutique located on the world-renowned 6th street in Austin, Texas.